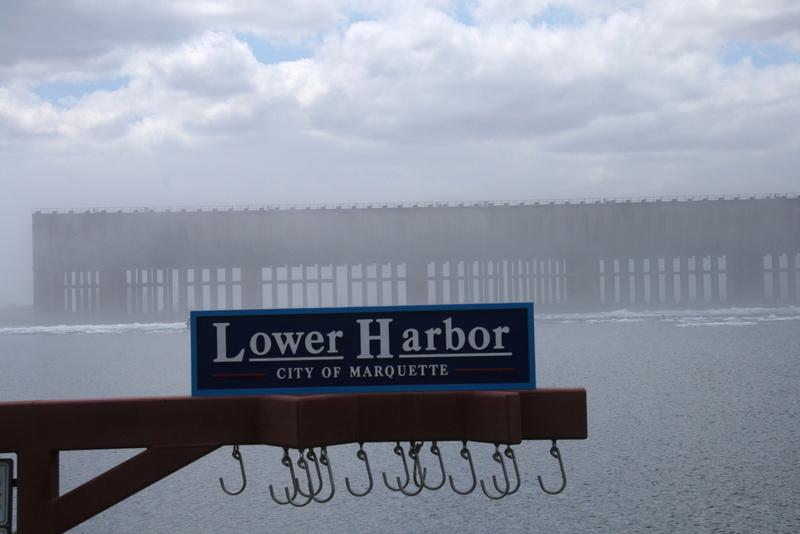 I so enjoyed a three-mile walk along Marquette’s Lower Harbor on Wednesday. 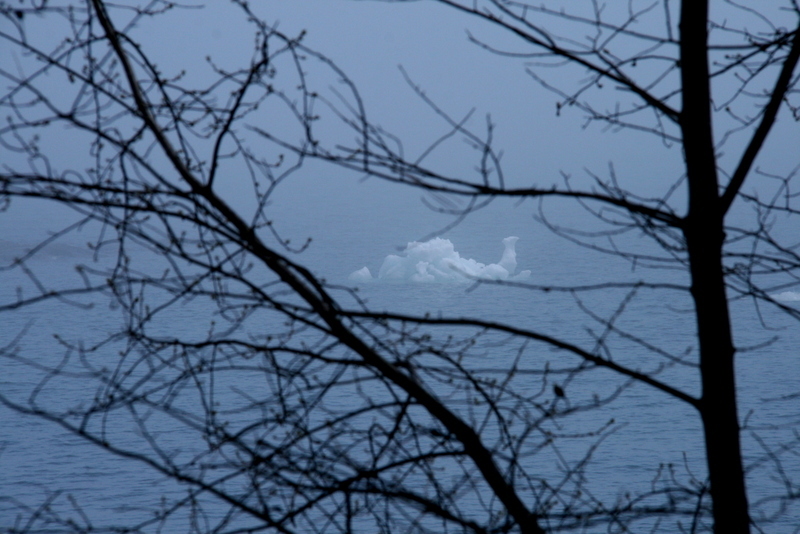 ‘Twas another foggy day with chunks of ice melting in Lake Superior. 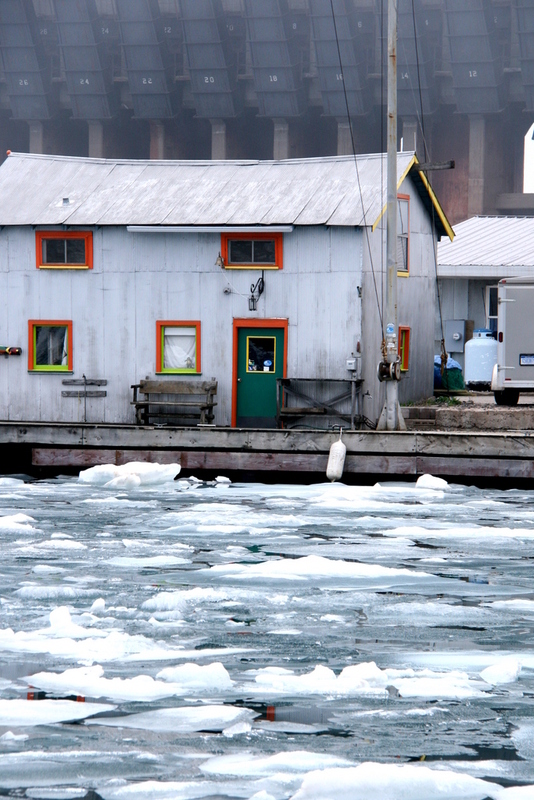 Snapped fifty pictures of the ore dock, harbor, fish house, lighthouse, fisherfolk, marina, you name it. Am enjoying taking photos again–and sharing them with you. Happy Memorial Day weekend, by whichever harbor you find yourself–even if it’s the harbor of home. Even a sighting of Puff the Magic Dragon! 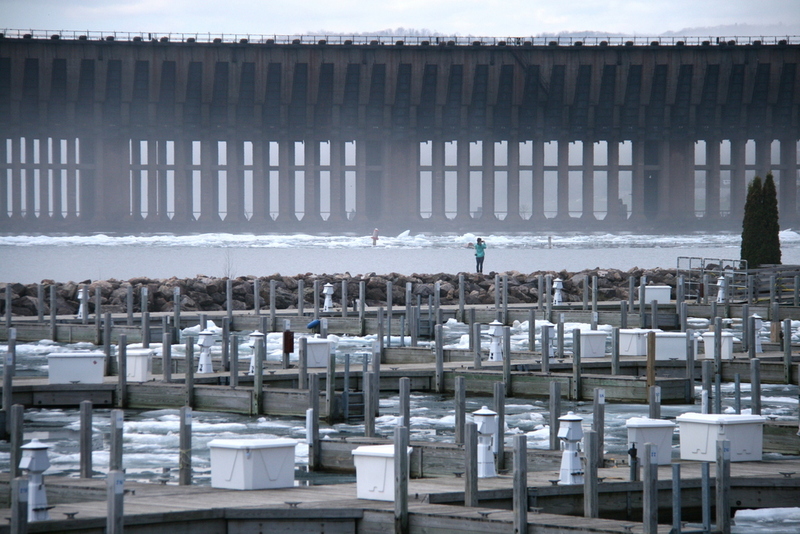 This entry was posted in May 2014 and tagged Lake Superior, Marquette, Marquette Lower Harbor, Marquette Marina, Michigan, Ore Dock, photography, Upper Peninsula. Bookmark the permalink. 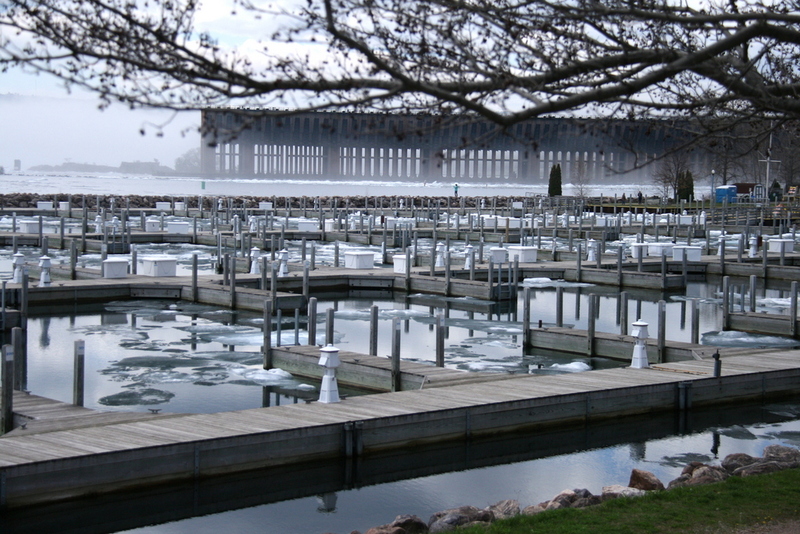 Those docks look downright eager for the boats to show up. Will it be sails or yachts? Sorry–I kept meaning to get back to your question. Both sails and yachts shall moor here, Lisa. 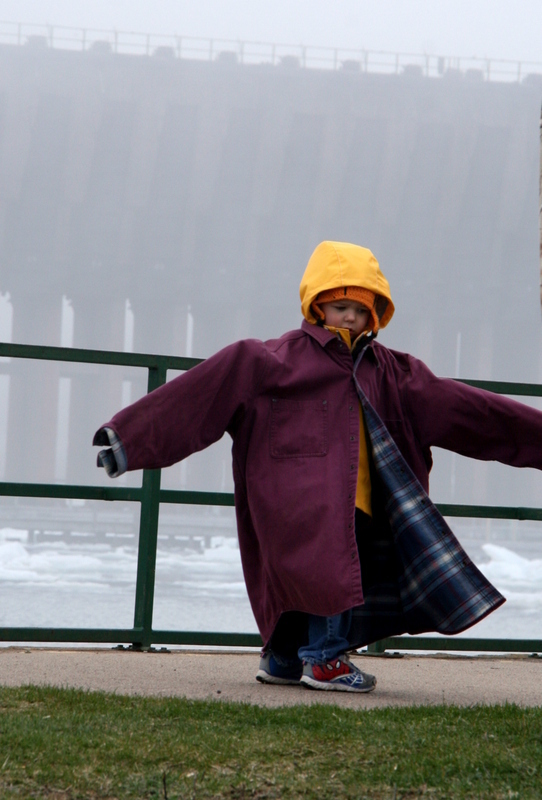 The child in the raincoat is adorable! Nice pictures..
Wow..you still have a lot of ice up there. The heat is coming your way this weekend which should help melt the rest of it. I will be celebrating from my harbor of home this weekend, safe and out of the traffic in the mountains of beautiful western North Carolina. Although I did call home Munising Michigan for Five glorious years, thanks for all the pictures of the U.P. they feed my soul, I do miss the U.P. so very much and your posts and pictures bring me back, thank you! Really neat pictures, Kathy. 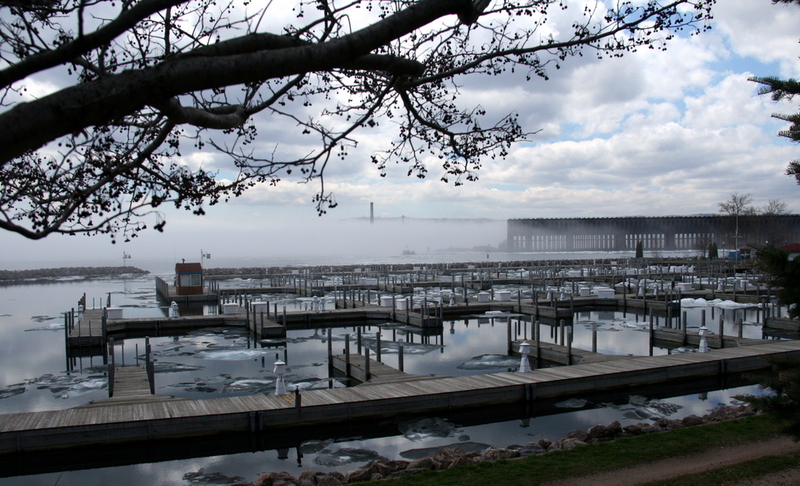 It’s amazing how much ice is still floating. 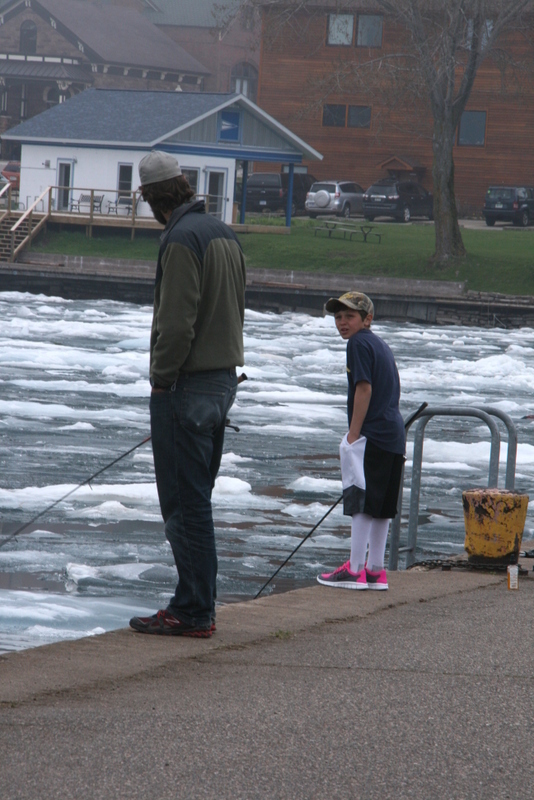 I felt cold when I looked at the picture of the boy in short sleeves, fishing. Brrrrr. The over-sized raincoat is cute. Oh so cold! I enjoyed the walk to the marina, but confess to being happy I was in my warmer place while we walked. So many whimsical photos – I can’t choose a favorite! Love the little girl, and the boy in the pink shoes reminds me so much of my nephew. I’m a touch envious of your lovely fog, but not too much as that does no good 😉 The windows on the fishhouse are delightful. And I saw Puff the Magic Camel, but I suppose him being a dragon does make more sense! What a winter! 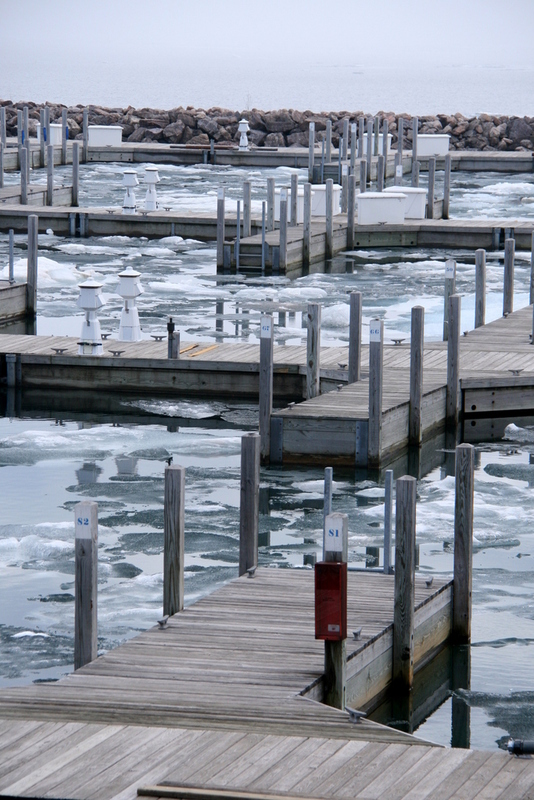 It’s almost June and you’re still surrounded by ice. March really was cold. And perhaps April too. All that ice you still have! 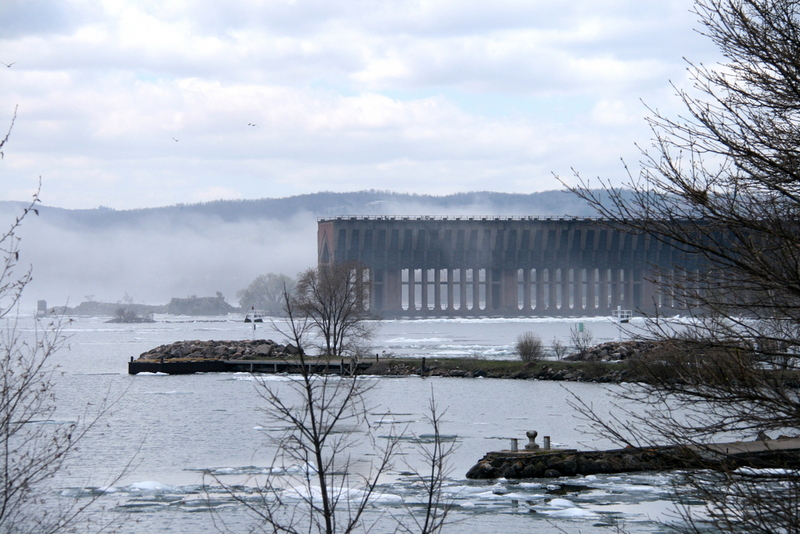 Last time I was down by that harbor, there were bare-shouldered kayakers on ice-free water. (Of course, that was in September.) Our Lake Michigan water temperature between Leland and South Manitou Island yesterday was, I’m told, 34 degrees. For Memorial Day weekend, that’s pretty darn close to ice in my book. Love that little person in the raincoat! You captured the lake front so perfectly! I MISS MICHIGAN OFTEN BUT THINK I WILL OPT FOR GEORGIA’S NEAR 90’S THIS WEEKEND. It is surely a bit nippy there, but the photos are delightful! I love the little guy in the oversized coat and the magic dragon. 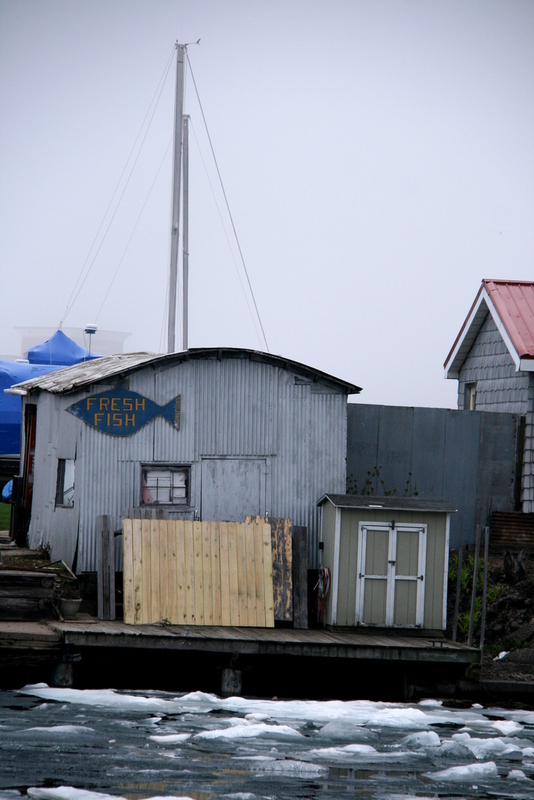 And the fish dock makes everything look mysteriously foreign. Beautiful and evocative photos Kathy. I’ve always been drawn to working harbors like this. Wishing you a happy long weekend! Very different pictures Kathy. Memorial day, not sure what exactly it is. trying to read more…. Love the lighthouse in the fog. I can’t wait to sleep the day away, Memorial Day is my relaxing holiday. Hope the ice is all gone soon. Seeing those guys fishing beside that ice makes me jittery, I can just feel the cold. Hope you have a great weekend, Kathy! I like the lighthouse in fog pic the most. All of these are very nice. It’s good to see what northern Michigan looks like. But that sure is lots of ice. Ooh, I love the lighthouse in the fog! 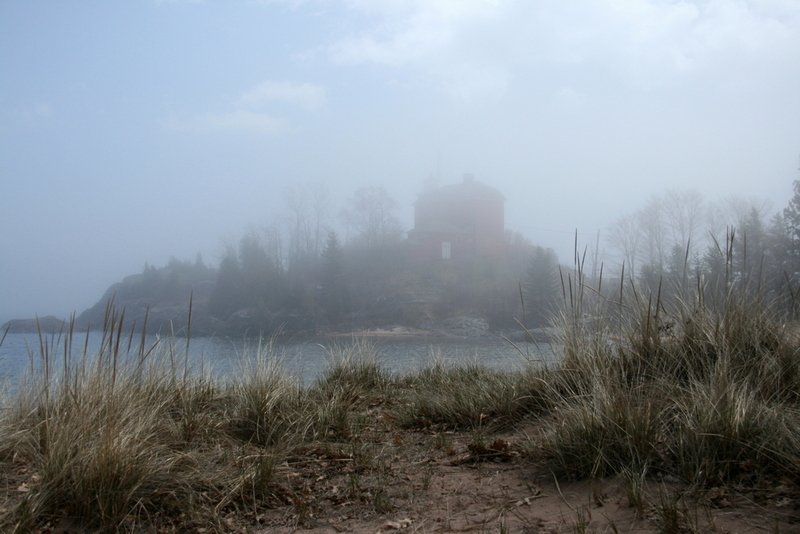 I love the lighthouse in the fog too ! I had to close my eyes for all the images containing ice — sorry. You make me want to visit. I’m glad you’re sharing pictures again.